We’ve all heard that rising global temperatures are bad for the environment. Typically, this is framed in terms of rising sea levels and melting Arctic and Antarctic ice and a host of other ecosystem level changes. Sometimes though, the ways these changes affect organisms are more difficult to understand. For years, coral reefs have been dying in a process called bleaching which has been linked to rising sea temperatures and lowered pH. However, exactly how that happens wasn’t so clear and a research study led by David Baker sought to answer exactly that. 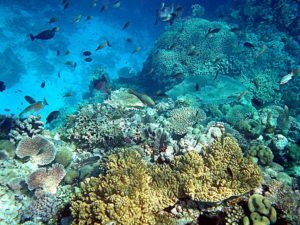 Like most living things, corals provide a home to microbes of all kinds, one of them being a tiny single-celled organism called a symbiodinium. In return for corals housing these microbes, they provide the host with nutrients from their photosynthetic activities in a symbiotic system. The result is a beautiful reef that is able to both use the surrounding ocean waters and sunlight to survive. However, at times this does not happen. Previous observations of bleaching events led to several possibilities as to how they take place. Given enough time and temperature increase, the symbiodinium leave (or are kicked out) by the coral. Because the corals themselves derive their color from their symbiotic partners, ultimately they fade to gray before dying.